Fishing and fisheries related activities in Lamu county accounts for over 70% of household incomes in Lamu East, Lamu Island and the adjacent fishing villages inhabiting the shorelines in Lamu west Sub County. In order to boost fishing productivity department of fisheries embark on a program of outboard engine revolving fund which the fishermen were given boat engine on subsidizing price. The county government pays 20% and the boat owner pays the remaining 80% in a three month grace period and later pays in the fourth month in an installment of 3500 per month. More than 115 fishermen were given 15 hp boat engines in which 1380 men were benefited indirectly. The aim was to improve fishing production by fishing for longer hours and reach the fishing ground in time and excess to market with no worry about low and high ties. Also was to improve on fish qualities of which the fish will get to the market early with fresh fish. The greatest beneficiaries of this project were major landing site of kizingitini, faza, Lamu, and Matondoni. others places are Kiunga,Kiwayuu,Mkokoni ,Mtangwanda,Bwajumwali,Myabogi,Tchundwa,Mokowe ,Mkunumbi ,Ndambwe,Kipungani,Ishakani and Shella. 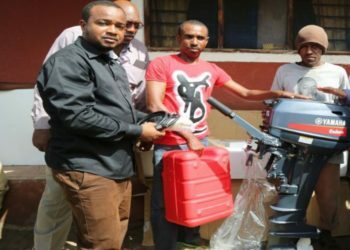 The department future requested Red Cross to sponsor venerable fishing community with engine machine and they distribute 15 engines to Ndununi, Kiangwi, Mkokoni, Ishakani and Ngiini. Also, the department went ahead and request supplier of outboard boat engine captain andiys to offer services and training to fishermen. Department facilitates transport and the supplier give free service to some of the key landing sites of Lamu,Faza,Kizingitini and Matondoni. Apart from the machine given to the fishermen also they give out fishing lines, 3000 diving masks, net, GPS gadgets and cooler box. Overwhelming demand for the outboard engine machine- given out were 115 over the demand of 624. Maintenance support to ensure sustainability of the machine. Small allocation is not sufficient to the department; it needs more allocation because for 115 machines took over a period of four years which means if not improved on allocation it will take around 20 years to fill the gap. Low payment rate –the amount which was paid back was only 40%. Strategic ice marking plant and cooled storage facilities in Kiunga, Kizingitini, Faza and Mokowe but already Kizingitini and Faza are in place waiting to kick off. In Mokowe they have put up container raised fishing storage but are yet to operate because of the shortage of water and electricity.